PORT LOUIS, July 27 (Xinhua) -- Chinese President Xi Jinping arrived in Mauritius on Friday for a friendly visit to the country. 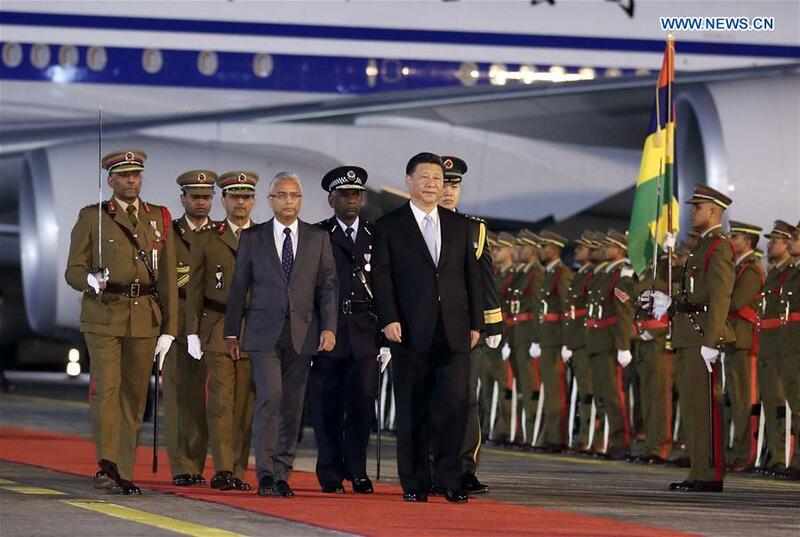 Xi and his wife, Peng Liyuan, were received by Mauritian Prime Minister Pravind Jugnauth and his wife, Kobita Ramdanee, at the airport in the capital Port Louis where Jugnauth held a grand ceremony in Xi's honor. The two leaders had a cordial talk. Xi said he felt the profound friendship the people and the government of Mauritius have towards the Chinese people upon arrival. China and Mauritius have enjoyed friendly bilateral relations, Xi said, adding that he looks forward to exchanging views with Jugnauth on bilateral relations and on international and regional issues of mutual concern. Extending warm welcome to Xi, Jugnauth said it is his honor to receive the Chinese president and he looks forward to meeting with Xi on Saturday. Mauritius is the last stop in Xi's first overseas trip after he was re-elected Chinese president in March. He visited the United Arab Emirates, Senegal, Rwanda and South Africa. He also attended the 10th BRICS summit in Johannesburg.